MI6. Oil on panel, 12" x 12". Not for sale. Many homework assignments were given over the course of making Mixology With a Twist, but Ruins' Crystal Bertholic dished out the biggest one of all. She sent not one or two, but five recipes to try. By the time I collected the ingredients, the book deadline loomed large, and painting time was nearly gone. So we had to narrow it down to one. Vying against contenders such as DJ Lance and the Black Yukon Sucker Punch, MI6 stood out. Clean and light, this spiritous drink filled a needed position in the recipe lineup. The MI6 is a twist on the classic Vesper, and is named for the British secret service. It adds a lovely, subtle floral note with chamomile liqueur, offset with a dash of bitters. Wanting to capture the bright elegance of the drink in the painting, I bought a mid-century stainless mixing pitcher (thanks, Raising the Bar!) as a nod to the 1953 James Bond novel "Casino Royale," in which Vesper Lynde appears. 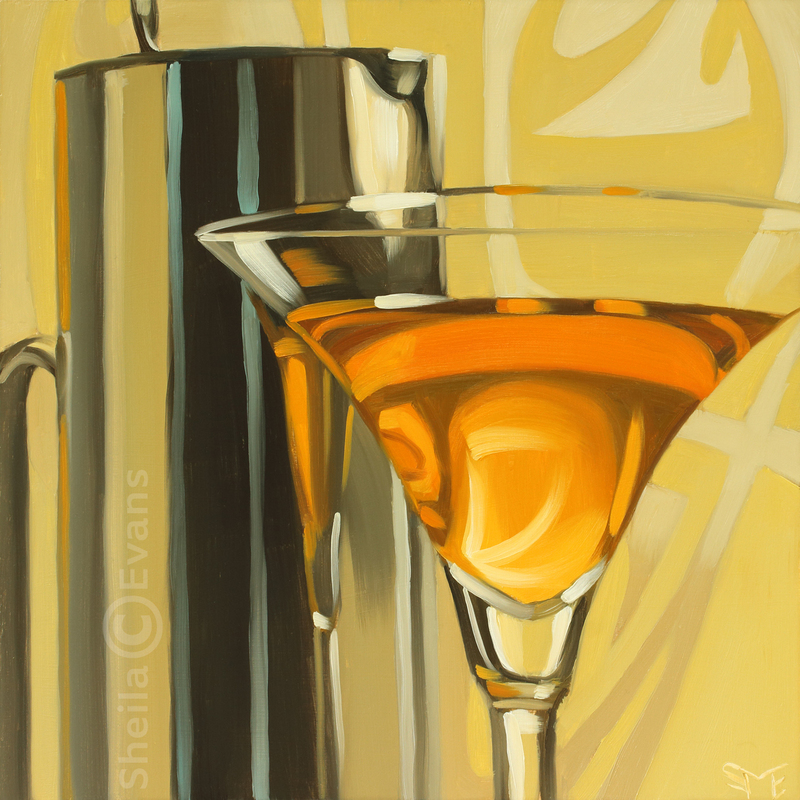 The metallic pattern in the art deco wallpaper reflects in the drink, emphasizing its clarity. MI6 ended up one of my favorite paintings from the book. Lucky for me, as my husband claimed it, and now I will have to look at it for a very long time. Adriana Janovich featured the MI6 prominently in her article about Mixology With a Twist in the Spokesman-Review. You can read the article here.